This fall started out quite warm with sunny, balmy temperatures stretching into mid-November. However, since this is a La Niña year, we've been having predictions of an extremely cold winter and we saw some of it this last week. The Monday before Thanksgiving we got enough snow to put the city of Seattle into a tailspin. My husband was fortunate enough to get out of downtown on a less travelled bus route extending his commute only by a half hour or so. Others weren't so lucky - it took his oncologist 7 hours to get home that night. The rest of the week we saw temperatures down into the teens with highs in the mid-twenties, which is very unusual around these parts. Since our chicken coop is fairly well closed up, with plexiglass on the biggest of the "windows", I wasn't too worried about the chickens. I could always cover up the other windows and pull up the ramp to really seal them in. They've been putting on a lot of feathers over the last few weeks, and I was really only concerned about the smallest one, Chloe, who isn't packing as much fluff as the other girls. I made sure there was extra bedding in the coop to snuggle up in if she wanted to, but I think they really just huddled together on the roost at night. The biggest issue, however, was keeping their water supply liquid. Since I didn't have a solution at hand, I ended up replacing their water several times a day. Their main water tank froze up into a solid tube of ice, so they relied on the water bowl I supplied them. Now that the temperatures are back up into the normal range, it's business as usual, but I will be getting a heated dog bowl to use for the next time it's that cold, just to make sure they have ample water. In spite of all the cold, snow and craziness, Chloe managed to start laying. She really likes hanging out in the nesting box and Roxy has been indulging her own broodiness by sitting on both their eggs. Alas, Sarah, the big white hen, spends more time eating and less time laying. She hasn't laid an egg since we first got her back in mid-September. All in all, the chickens did fine. They didn't spend much time down in the run when the wind blew a bunch of snow down there. But, once I cleaned out the snow, they were back down in the run, digging and bagawking and searching for snacks of the buggy kind. I froze my tail off with all the oversight, but I'll be prepared for the next cold snap. Do you have chickens? If so, how do they fare during cold weather? Do you have a heat lamp or other set up to keep them comfy? For a tour of my chicken coop and an introduction to the girls, you can check out this video here. I use hot water from the coffee carafe. chickens will peck at snow, which is a source of water for them as well. I have a larger (8x8) coop. Once the chickens get their feathers and start sitting the roost - that is where they stay a night, whatever temperature. I have two largish tilt-in windows on the south wall, and two horizontal louvered vents about 3x1 on the north wall, above the roosts. The ceiling is insulated, and slants down to the north. The side walls have a 1/4 inch plywood inner wall up four foot, the sides of the coop are tin siding. The floor is 3/4 inch plywood. The building is 12x8, the door/feed area is on the east side of the coop part, and I try to close the door on windy nights. We get temps down in the 20s and teens regularly on winter nights, occasionally to 10 below Fahrenheit. I open the thin, Plexiglas louvers on the rear vent in summer, most of the way. In winter they are mostly closed but not well sealed. The tilt in windows are about 40 inches high, and tilt in to make about an 8 inch gap at the top; this makes for an indirect air movement. I have left the windows tilted in since I built the coop, about 9/11 (I remember listening to the reports while welding up the structure). Yes, it stays a bit drafty all winter. But the draft stays mostly indirect. Which is what I have been told is important. Chickens left on their own will nest in trees - open to the wind. They suffer more from stuffy air than from direct cold, I am told. I know their daytime activity in winter is hampered by fresh, deep snow - but seldom for actual temperature extremes. I use a chicken waterer heater, it looks like an upside down pan that goes under the waterer. I use a 45 degree plugin thermostat (from Lowe's) that doesn't apply power to the heater over 45 degrees, which kind of duplicates the thermostat in the heater, but I worry less about the heater. (I picked the heater up used, ten years ago, and nothing lasts forever.) With only the four birds left (something took out two of my three hens), I use a plastic gallon waterer. Seems to work OK for the chickens. We have 27 in Minnesota. The chooks are in an old drafty barn with no light (other than window & door), heater, or insulation. The draft is cut down by all the wood we had to line the coop in for security from predators since we live on a little river. We use a metal watering can & heated base. Last year we only had one rooster suffer from a tiny bit of frostbit on his comb. After a little bit it healed up and you could never tell it happened. They stay warm together, and we have cold hardy breeds. Temps got down to -30 last year. If it gets below 18 degrees here (overnight), I place the 5 hens in a huge box with hay and put them in the shed which is much better insulated than their coop (not insulated at all). In the morning, they go right back in the coop no matter what the temp. They seem to enjoy the snow (an inch or two), but ice is a whole other story. I do like the heated water bowl idea. I usually change their water two or three times a day during the winter. Growing up in Minnesota, we had chickens, ducks, turkeys, geese, and guineas. We always just kept them supplied with a large bowl of clean snow in the coop for their water. They did just fine. We built a little igloo out of hay bales and they huddled together in there when it got coldest, but often they still chose to go outside during the day. Our Ohio chickens over-wintered in a drafty pole barn without any problems at all. We had a pen that was basically an 8-foot cube, two sides of sheet metal, one side plywood nest boxes, and one side chicken wire - in other words, not very well insulated, to say the least. So I put a heat lamp in there. They actually avoided it. They'd roost as far away from it as they could get, which I thought was odd. But they were the chickens, so I took it out and they did fine. Even in sub-zero weather, even in 2 feet of snow. I was actually quite amazed. I guess 16 hens generate enough heat themselves to do fine, as long as they roost together. I had one hen who decided she wanted to roost by herself, but I'd go in after they were asleep and move her over with the others. After a few nights, she quit trying to roost by herself. I should add that we made a point of getting cold-weather heritage breeds - buckeyes and dominiques, which both have tiny rose combs and are known to be tough breeds. At any rate, I was always stunned that out of 26 baby chicks, we only lost two, not counting the ones we butchered ourselves. One chick died after a couple weeks. And a rooster died of illness or natural causes at about 2 years old. None were lost to weather or predators. For water, we just kept a spare waterer on hand. If it was cold enough for their water to freeze, I'd bring it inside and put out the spare, alternating them as needed. Like EngineerChic, I'm using hot water - I take a 3ltr kettle full down with me in the morning, which I use to melt the ice and refill the drinkers - it evens out so the water in the drinkers is lukewarm by the end of it. I've also make a porridge out of more hot water and their layers pellets, and give them more corn/treats throughout the day since they're not getting as many extras from the ground at the moment. We were down to about -6C/20F over the weekend but the warming water & porridge kept them happy enough - all our layers laid eggs both days. Someone on my blog has suggested using chilli pepper flakes - apparently it kept hers happy and laying all winter! 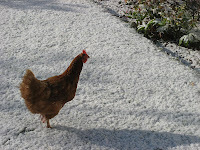 -15 C here last week - that means water twice a day to chickens, a heat lamp once it gets below -5C. Uninsulated coop and free daytime access to their run. They are still laying but only an egg per chicken every 3-4 days. They are doing fine. Damp and wind are worse that cold and we get neither. For too hot water try light colored hoses and a drip system. Hot water CAN freeze faster than cold, but only in certain circumstances. Most chicken watering devices have a large column of water in the center vessel and a small trough of exposed water. That enclosed column limits the amount of water lost to evaporation & the amount of convection, two of the factors that can make hot water freeze faster than cold. But ... purely anecdotally ... when I was too late or too lazy to lug hot water up the hill to the chickens, their water would be frozen solid when I got home that evening. When I did use hot water in their watering can, ice would have begun to form around the edges of the column but there would still be water in the trough & the center of the column. My chickens come into the shed for winter here in PA. They get no heat or insulation, and the double doors are thrown wide every morning on all but the very worst days. They don't need anything but protection from the wind, which the shed provides. They roost together on a short bar to keep each other warm at night. Each morning in winter I fill their waterer with very warm water. It freezes by the next morning, but I don't see a problem with that. They will peck through thin ice, and anyway, most wild animals do not hang out immediately near their water source during winter in order to sip throughout the day. They may drink only once or twice a day. I'm told that domesticated hoofstock fill up as little as once a day in winter as well. So in my opinion, heated water is not necessary for chickens unless the water is going to freeze in just a few hours where you live. Years of outdoor watering of horses and dogs, as well as a hawk and two owls in New England winters leads to my suggestion of the heavy black rubber bowls for freezing weather watering. If the water freezes solid, these types of buckets/bowls will tolerate a good deal of hammering, kicking or stomping to get them to flex enough to yield their ice so you can refill with water rather than dropping your water into a partially icy container. I like to have at least one more than I need of a size so that I can keep one inside the house/barn in case I get particularly recalcitrant ice. It also lets me bring in a container for cleaning while still watering if I find it's needed. We live in northern British Columbia and it can get very cold here. I don't let the chickens and ducks out if it is colder than -18c (0f) or if the wind is blowing hard. I leave them in their insulated hen house with a heat lamp. The heat lamp is actually on 24/7 over the winter. I have had problems with the waterer freezing in the hen house and not being able to open up the lid. I now use large crocks (from oval type crockpots which are fairly shallow) and fill with warm water. It doesn't freeze as easily and if it does I can break the ice off the top, remove and refill. So far it is working well even when we had -33c (-27f) last month.